One thing that I’ve noticed, time and time again, is how damn good Neil Gaiman is at writing an ending. From Sandman to Neverwhere to The Graveyard Book, Gaiman wraps up his tales in such a soft, melancholic way that I can’t help but feel both satisfied in its closure and glad that I was a part of the journey. By the end of Ocean at the End of the Lane, I felt so connected, so viscerally involved in this short snippet of the characters’ lives, that any amount of absurdity that occurred, for me, felt real. And threatening. 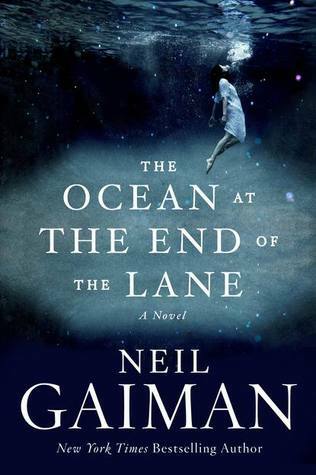 Gaiman crafts the story in such well-paced, powerful prose that each word marks a significant step in the development of both the unnamed protagonist as well as the tale itself, deeply drawing the reader into this story of growth and of beauteous innocence. The story itself revolves around an unnamed fellow who visits an important, yet vague place from his childhood, where he relapses into memories that he had, until now, casually forgotten. He remembers being a child of seven years old and the events that unfolded around his birthday party: a suicide, a new friend, and a set of darkly magical occurrences that put his seven-year-old heart to the test. The book hits you right in the feels, as oddity turns to tragedy around this small boy and his constant fears are confessed to us in a most intimate fashion. Truly, Neil Gaiman has outdone himself, refocusing his metaphorical genius on the terror of growth and the unknown vs. the familiar. Much like in Coraline, there is the conflict with the Elder (capital E) and the utter helplessness that comes from being so dependent on an authority that refuses to acknowledge that of a lesser age. But unlike Coraline’s hero, Ocean at the End of the Lane was never meant for younger readers to find strength in. Rather, it exists as more of an introspective calling for adults to hearken back to what it felt like to be scared and ignored, forgotten and disbelieved. It is a deceptively heavy work of love that means more to the author than we will ever know. And yet I find it to be perfectly all right. Surely. Always like to reblog good posts.